Enamel is so beautiful when done correctly and so hard to remove when done wrong! Lately I'm getting a lot of practice with removing enamel. 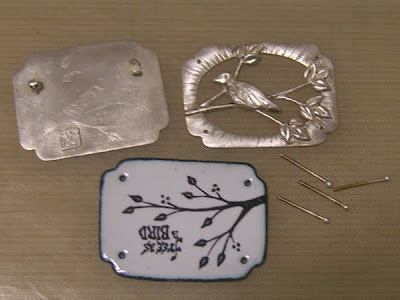 The technique I'm using came from Pam East's book "Enameling on Metal Clay." I've viewed this as a learning curve so as to have this skill in my toolbox when the day comes that I need to remove enamel from silver or copper clay. At the moment, I'm not removing enamel from metal clay at all. In fact, I'm working traditionally with smooth, sheet copper for my painted enamel, then mounting the enamel in silver via rivets. Even in this simpler situation, removing enamel is laborious and messy. Indeed, sawing a new piece of copper would be much easier, but not as educational. I expect that removing enamel from metal clay might be significantly harder, due to porosity of the metal surface, even if burnished heavily. This particular brooch has been a torturous project. Sometimes, pieces just have a mind of their own. The enamel I used for the first pass at the center layer bled into a black blob, causing me to embark on this enamel removal training. Then I reapplied the enamel carefully and successfully with a different material, only to realize that somewhere along the way I'd rotated the copper so that the text was upside down. I tried another coat of white enamel to see if it would cover the black well enough, but the results were not very successful. Daunted, but determined, I embarked on enamel removal number two. Mix equal parts of cream of tartar and salt. Add just enough distilled water to make a creamy paste. 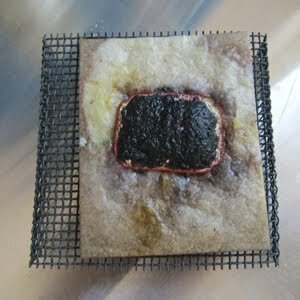 Cover enamel with the paste. 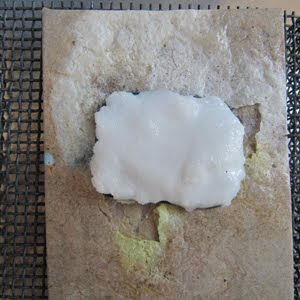 Place the work on a sheet of mica. Pop into the kiln at enameling temperature, where the paste will proceed to burn, blacken, bubble. and smoke. Pull the piece out and drop immediately into a bowl of cold water (you may have to dig the piece out of the mica with tweezers, as it sinks in). Pick off as much enamel as possible. 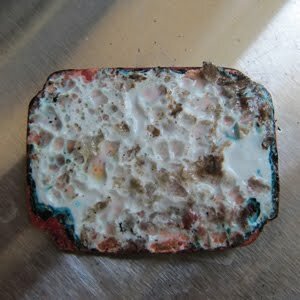 If the enamel is thick, it may need several treatments, especially if there was counter enamel, as on this piece. Repeat until enamel is gone. 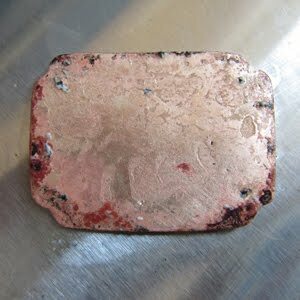 Then clean up the copper with a metal brush, sandpaper, pickle, etc. Somewhere along in here, I decided to change the enamel to revisit the techniques coming up in the class I'm scheduled to teach in Pennsylvania in October. (Get info here on Holly Gage's Website, and contact her for seat availability.) So I etched a design into the copper instead of painting it. Then I added a layer of enamel, front and back. Usually I do this technique with a torch for control, but I decided to experiment with the kiln instead because we may have better kiln access than torch availability. 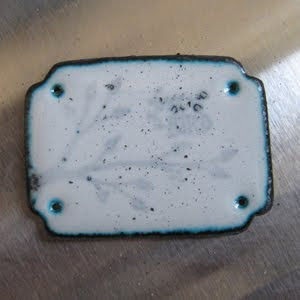 I became distracted with cleaning up some of the mess in my studio (right in front of the kiln, so an obvious hazard) and overcooked the enamel, causing it to pit. Sigh. Just repeat all those steps shown above, with extra rounds to get all the enamel out of the etching. Call me a pro at removing vitreous enamel! Thanks for this- I have some work to do!!! Thankyou, it worked a treat. Removed the old enamel from a John Atkins bird broach. Now we need to replace the tiny eye bead. Do you know where to get those? Sorry, I don't have a source for the tiny eye bead. As a glass worker, I would probably make what I wanted. Perhaps you can find a local glass person to help you?